BEIJING -- China's top judge and president of the Supreme People's Court, Wang Shengjun, is delivering a report on the work of the Supreme People's Court Tuesday afternoon at the Second Session of the 11th National People's Congress (NPC). -- The Supreme People's Court dealt with 10,553 cases of various types and concluded 7,725 cases, an increase of 29.53 percent and 24.2 percent, respectively, year-on-year. Chinese courts handled 10.71 million cases of various types, up 10.91 percent. -- Chinese courts concluded 768,130 criminal cases. A total of 159,020 criminals were sentenced to death, life imprisonment, or more than five years in prison, accounting for 15.79 percent of all criminals having been sentenced. -- Chinese courts concluded 286,221 labor dispute cases, up 93.93 percent; concluded 576,013 cases involving medical service, housing, and protection on consumer's rights, up 45.08 percent. 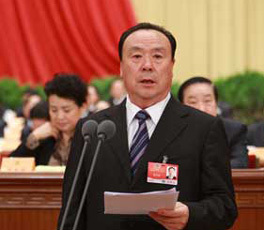 -- Chinese courts concluded 1.14 million cases concerning financial disputes, real estate disputes, company share-holding reform, transfer of stock ownership, foreign-related and maritime disputes, up 15.24 percent; concluded 21,674 market disruption cases involving fund accumulation fraud, illegal absorbing of public deposits, and producing and selling substandard food and drugs, up 13.48 percent. -- Chinese courts concluded 27,876 intellectual property right infringement cases, up 32.58 percent. -- Chinese courts concluded 3.17 million civil cases through mediation, accounting for 58.86 percent of total civil cases. -- The Supreme People's Court reviewed and handled 36,727 major cases involving letters and calls. Proportion for cases involving letters and calls that went into prosecution procedure dropped 49.74 percent. -- A total of 55,681 people's jurors attended the trial of 505,412 cases nationwide, with the number of cases up 34.05 percent year-on-year. -- to improve political awareness and competence of judges.